All posts in this series were combined into a single, extended tutorial and posted on my new blog. The last post promised to show some back testing results for the ARMA techniques. I decided to use the S&P 500 index for this purpose. What really impresses me in the above char it the staggering performance of this approach during the financial crisis. As if it was feeding on the increased market volatility! This fact is also illustrated by the side by side annual comparisons, which I usually use to get an idea of the long term performance. Both systems performed similarly during the 2000/2002 recession, however, there is a stark difference in the performance during the 2008/2009 crisis. 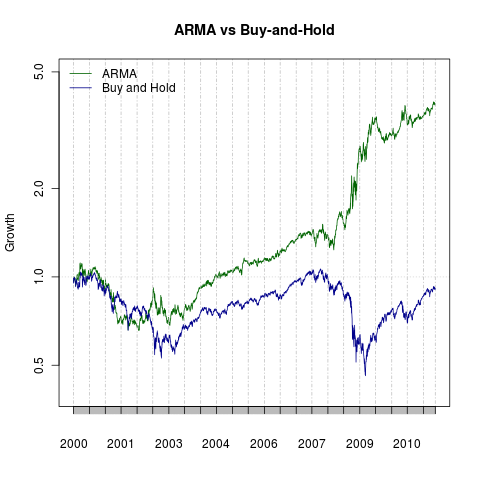 While buy and hold was losing money, the ARMA method registered it’s best year ever. Why did I show only the performance of the last 10 years? Believe it or not this is a very expensive computation. In fact, I have assembled a powerful i7 CPU machine just to be able to back test and trade these models. Almost 2 full days were necessary to compute the ARMA index for the past 10 years! I will consider publishing back testing for previous years, however, since S&P 500 is not a primary instrument for my trading, that’s not too likely to happen. What parameters I used to compute the ARMA index? The code is close to the code I have published in previous posts. I have used the fGarch package and my code always picked a GARCH(1,1) model. For the ARMA part, my code used all models between (0,0,1,1) and (5,5,1,1). I used 500 days of history. I mostly used the skewed Generalized Normal Distribution, specified by the cond.dist=”sged” parameter of garchFit, however, I obtained similar results using cond.dist=”sstd”.